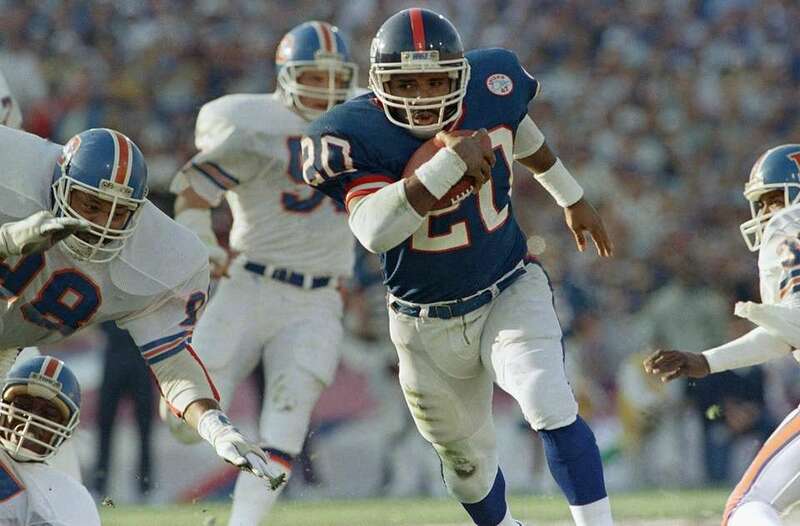 The Giants beat the Denver Broncos, 39-20, in Super Bowl XXI on Jan. 25, 1987, at the Rose Bowl in Pasadena, California. 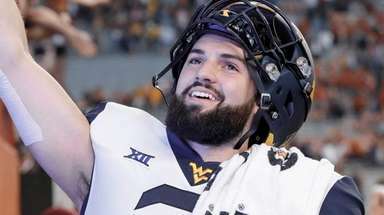 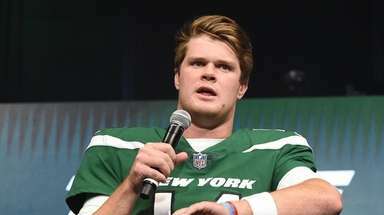 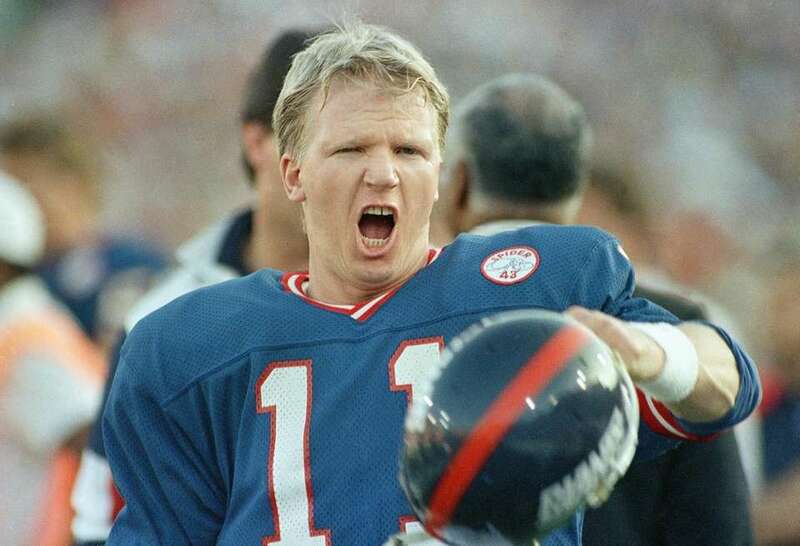 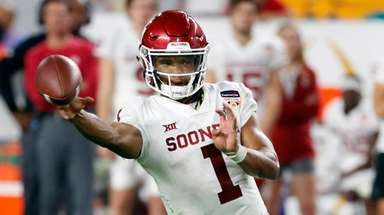 Phil Simms completed 22 of 25 passes for 268 yards and three touchdowns and was named the game's MVP. 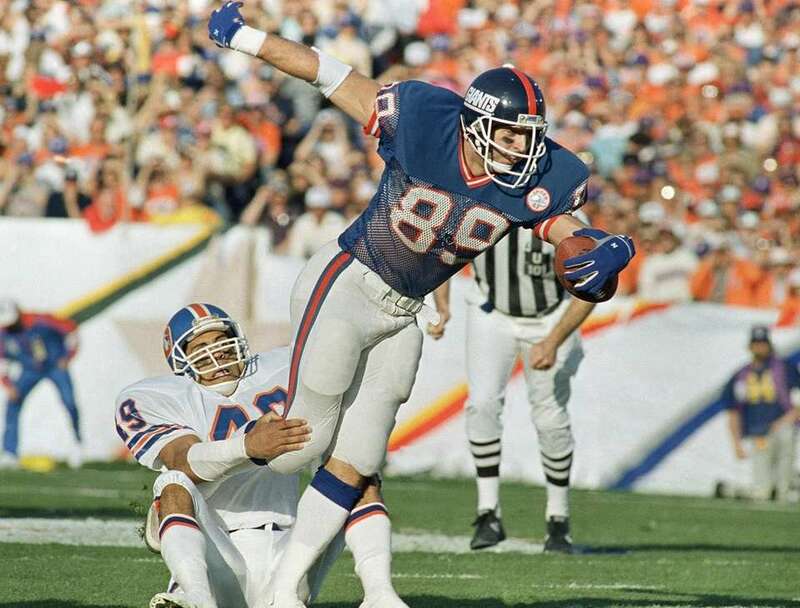 New York Giants tight end Mark Bavaro (89) is stopped by Denver Broncos Dennis Smith (49) after taking a 17-yard pass from quarterback Phil Simms in the first quarter of Super Bowl XXI in Pasadena, Calif., Jan. 25, 1987. 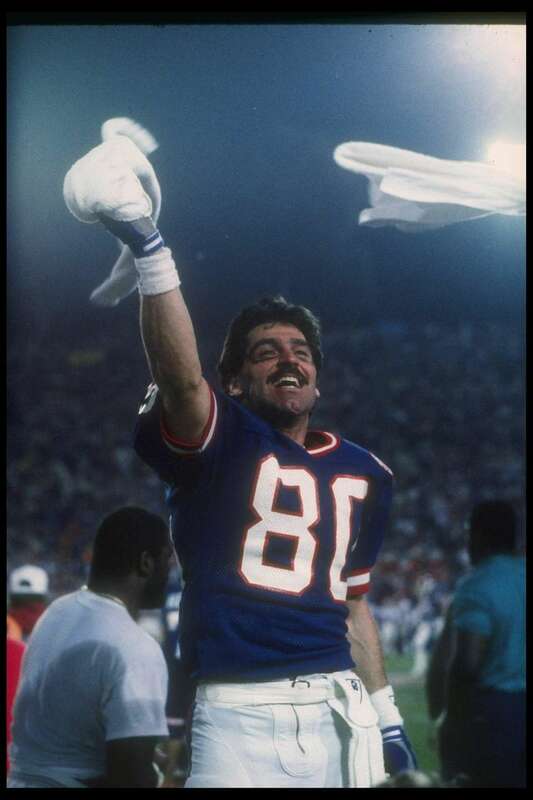 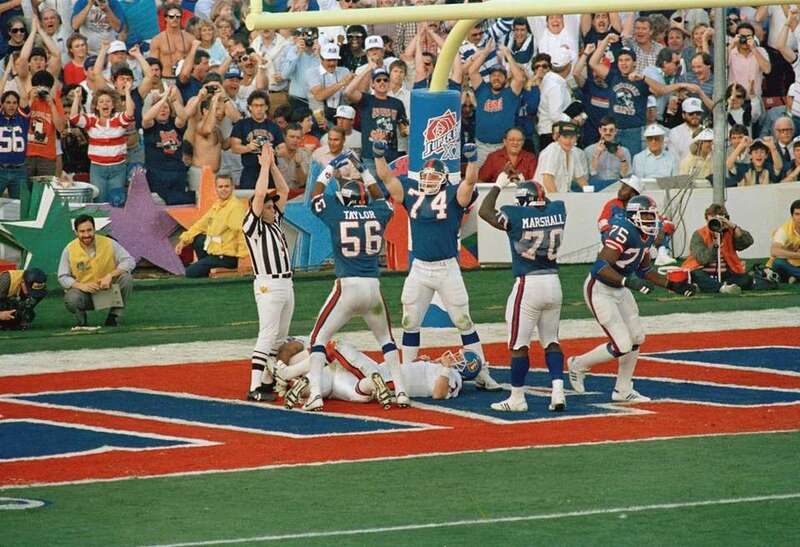 Wide receiver Phil McConkey of the New York Giants celebrates during Super Bowl XXI against the Denver Broncos at the Rose Bowl in Pasadena, California. 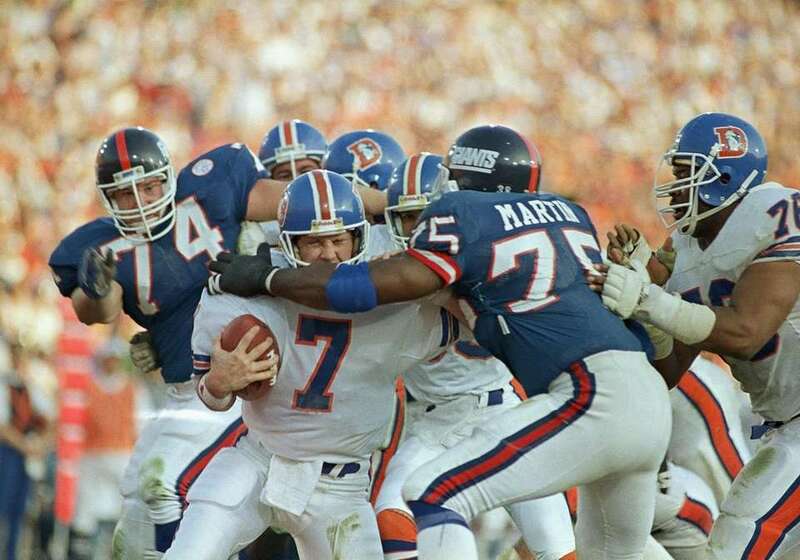 Denver Broncos quarterback John Elway looks up in frustration as the Broncos were stopped near the goal line in drive in second quarter of Super Bowl XXI in Pasadena, Calif., Sunday Jan. 25, 1987. 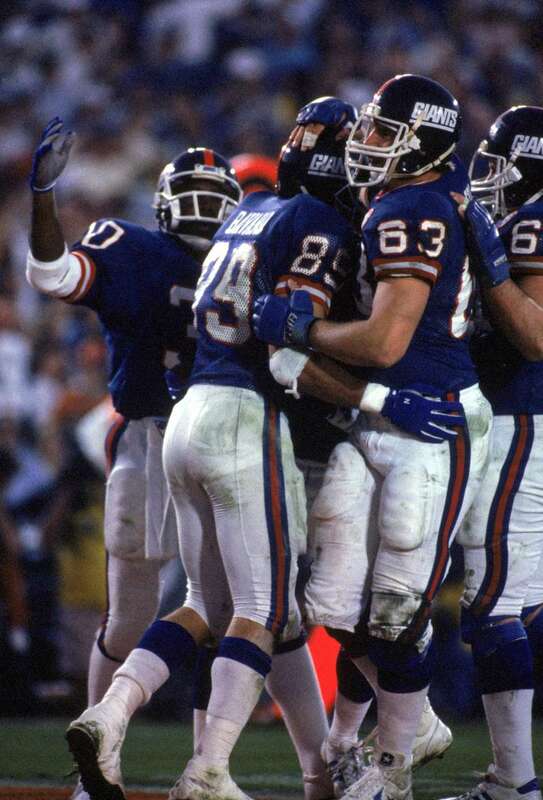 New York Giants defense Lawrence Taylor (56), Erik Howard (74) and Leonard Marshall (70) jubilate over Denver broncos quarterback John Elway after he was sacked by George Martin (75) for safety in second quarter of Super Bowl XXI in Pasadena, Calif., on Sunday Jan. 25, 1987. 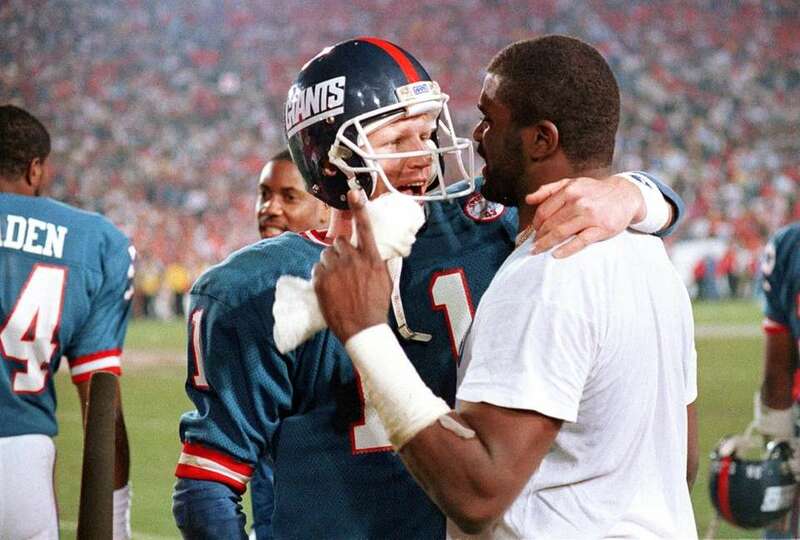 New York Giants quarterback Phil Simms reacts to penalty on Giants linebacker Harry Carson in the first quarter of Super Bowl XXI in Pasadena, Calif., Jan. 25, 1987. 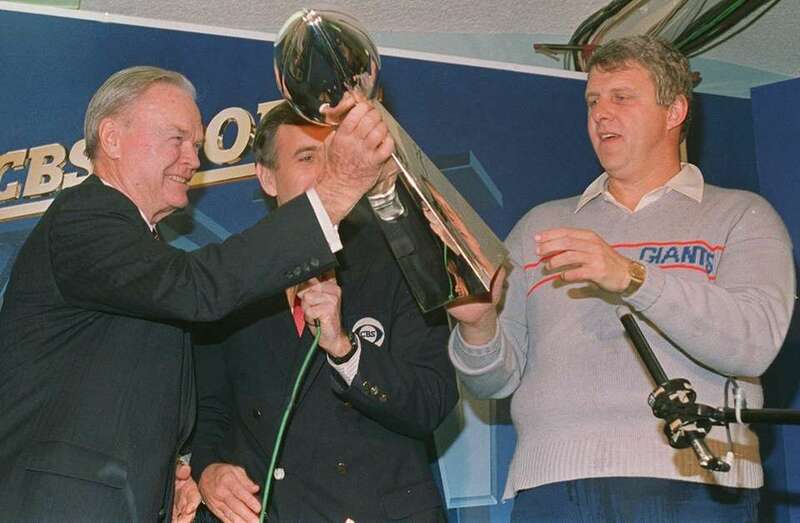 New York Giants quarterback Phil Simms winds up to pass in the first quarter of Super Bowl XXI, Jan. 25, 1987 in Pasadena, Calif.
Wellington T. Mara, left, president of the New York Giants, hands over the Super Bowl trophy to Giants coach Bill Parcells, right, after the Giants defeated the Denver Broncos 39-20 in Super Bowl XXI in Pasadena, Calif., Jan. 25, 1987. 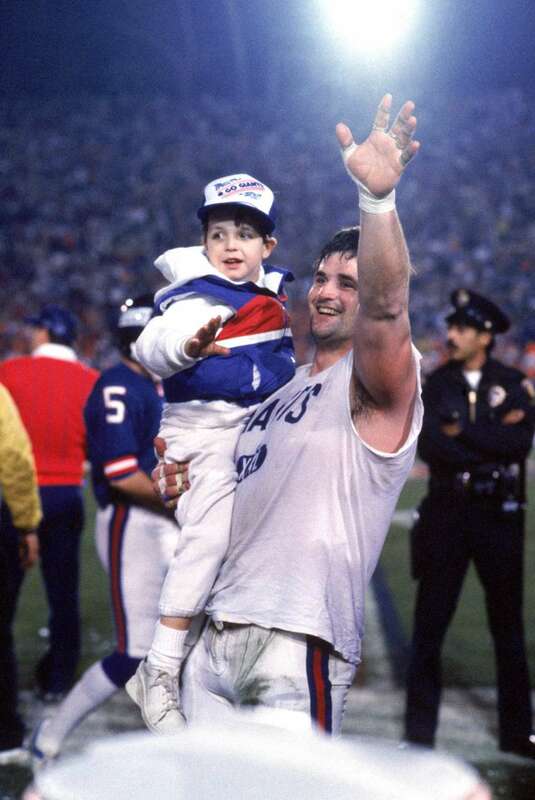 Defensive tackle Jim Burt #64 of the New York Giants celebrates on the sideline with his son near the end of the game against the Denver Broncos during Super Bowl XXI at the Rose Bowl on Jan. 25, 1987 in Pasadena, California. 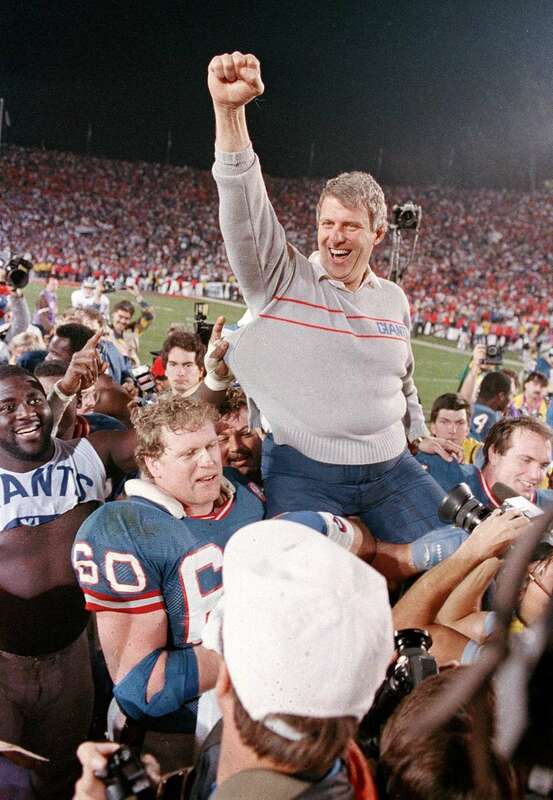 New York Giants coach Bill Parcells is carried off the field after the Giants defeated the Denver Broncos, 39-20, in Super Bowl XXI in Pasadena, Calif., on Jan. 25, 1987. 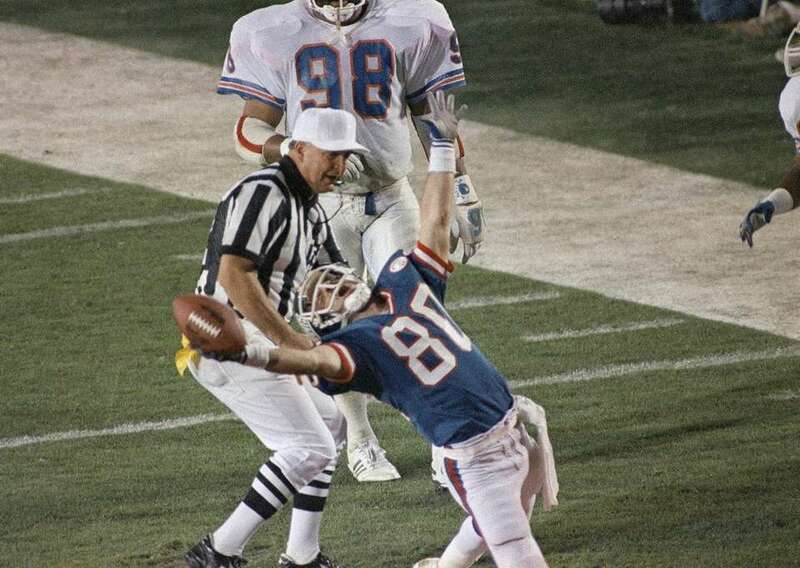 Tight end Mark Bavaro #89 lifts up wide receiver Phil McConkey #80 of the New York Giants after McConkey scored a touchdown against the Denver Broncos during Super Bowl XXI at the Rose Bowl on Jan. 25, 1987 in Pasadena, California. 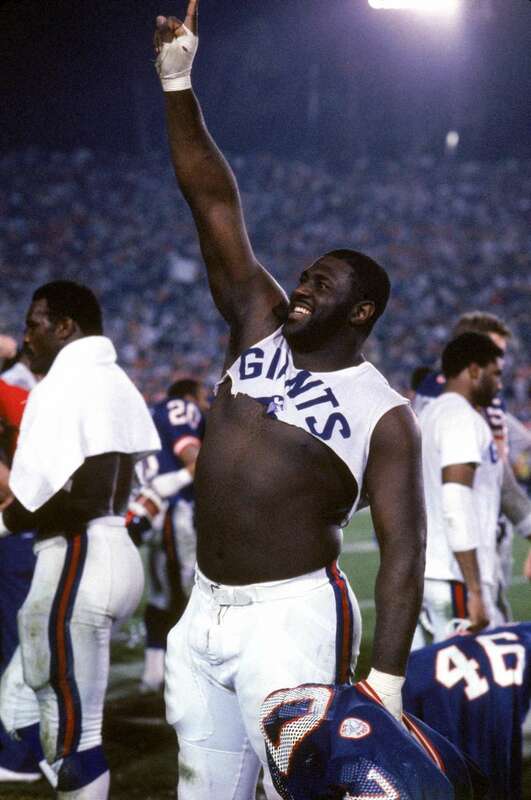 Defensive tackle Leonard Marshall #70 of the New York Giants celebrates on the sideline near the end of the game against the Denver Broncos during Super Bowl XXI at the Rose Bowl on Jan. 25, 1987 in Pasadena, California. 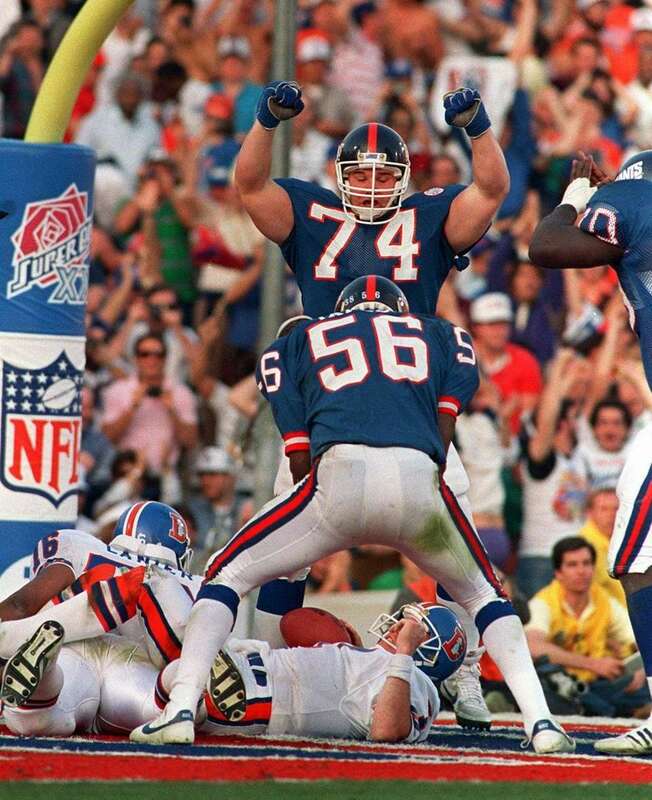 Offensive tackle Karl Nelson congratulates tight end Mark Bavaro #89 of the New York Giants after Bavaro scored a touchdown against the Denver Broncos during Super Bowl XXI at the Rose Bowl on Jan. 25, 1987 in Pasadena, California. 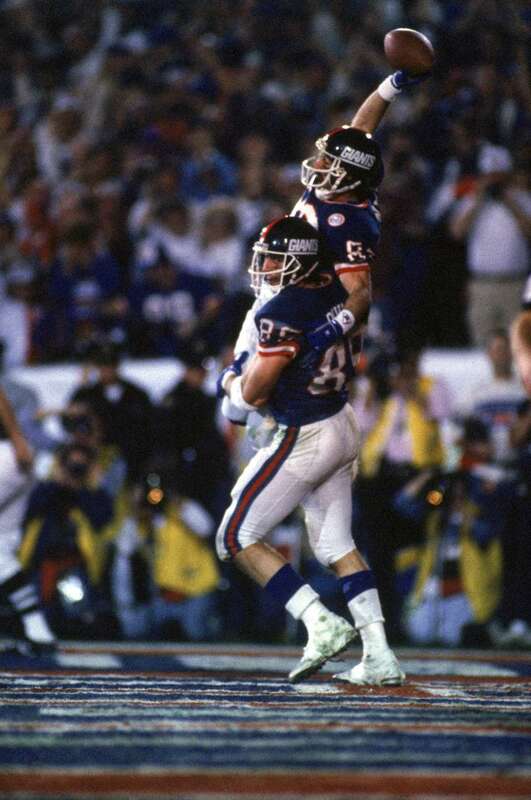 New York Giants Phil McConkey (80) flips through the air as he was stopped just short of the end zone after catching Phil Simms pass in the third quarter of Super Bowl XXI, Jan. 25, 1987 in Pasadena, Calif.
New York Giants quarterback Phil Simms (11) embraces linebacker Lawrence Taylor after the Giants defeated the Denver Broncos, 39-20, to win Super Bowl XXI in Pasadena, Ca., Sunday, Jan. 25, 1987. 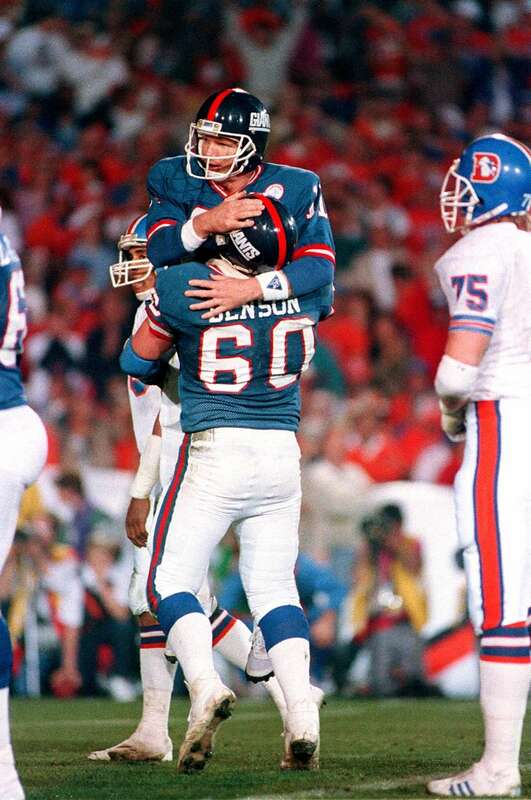 New York Giants quarterback Phil Simms (11) is hugged and picked up by teammate Brad Benson (60) after touchdown pass in fourth quarter of Super Bowl XXI game in Pasadena, Ca., Sunday, Jan. 25, 1987. 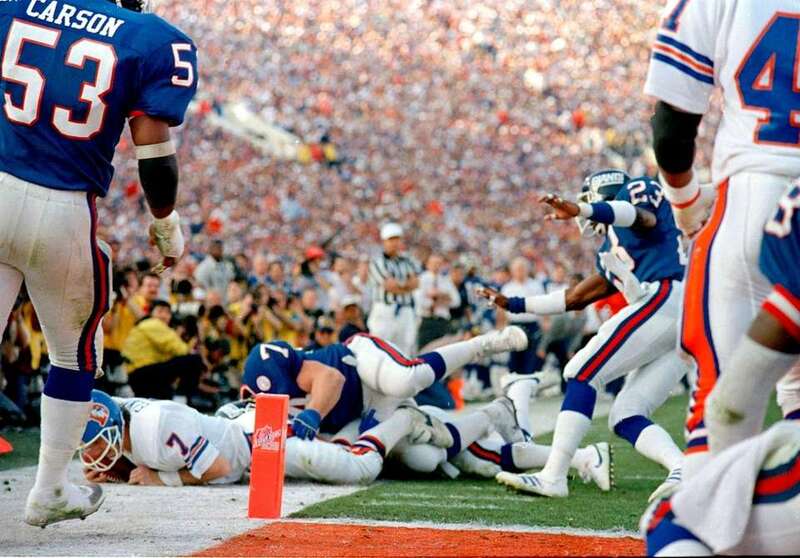 New York Giants Phil McConkey dives for the ball for a touchdown after it bounced off Mark Bavaro (left) in the fourth quarter of Super Bowl XXI, Jan. 25, 1987 in Pasadena. 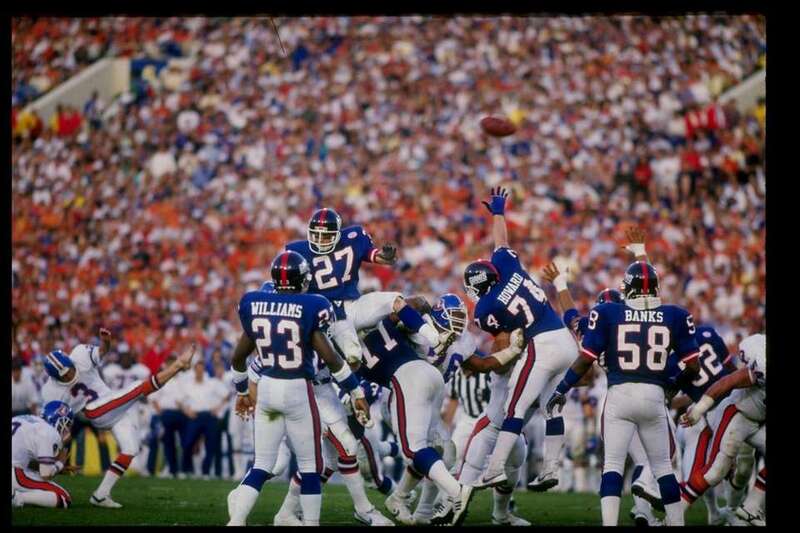 Defensive back Herb Welch of the New York Giants tries to block the kick of kicker Rich Karlis of the Denver Broncos during Super Bowl XXI at the Rose Bowl in Pasadena, California. 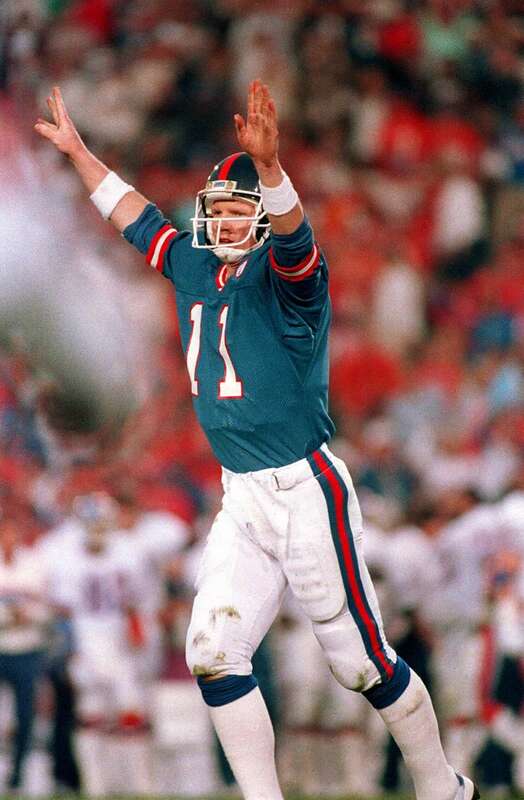 New York Giants quarterback Phil Simms (11) reacts after throwing a touchdown pass to Mark Bavaro to put the Giants ahead 15-10 in third quarter of Super Bowl XXI game in Pasadena, Ca., Sunday, Jan. 25, 1987. 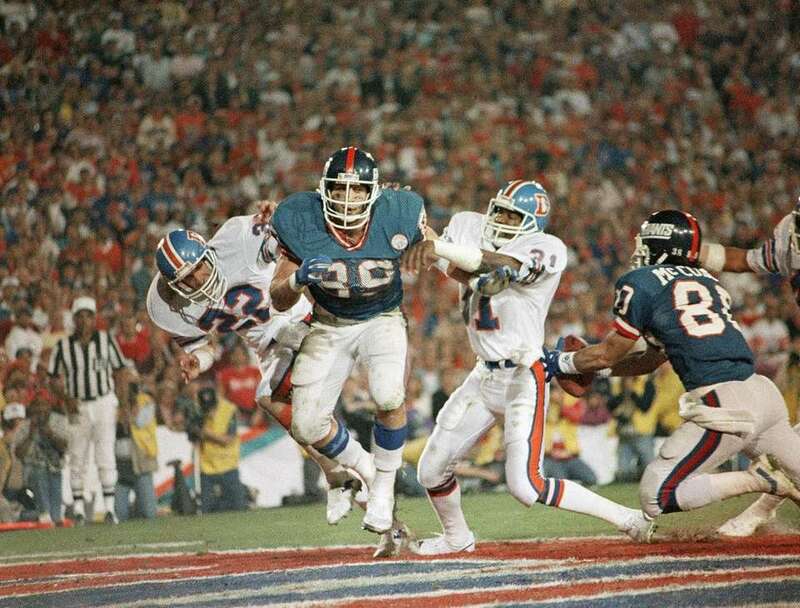 New York Giants running back Joe Morris (20) finds a hole for short gain in the third quarter of Super Bowl XXI, Jan. 25, 1987 in Pasadena, Calif.
New York Giants defender Erik Howard (74) and Lawrence Taylor (56) stand over Denver Broncos quarterback John Elway after he was sacked in the endzone for a safety during second quarter action in Super Bowl XXI in Pasadena, Calif., in this Jan. 25, 1987 photo. 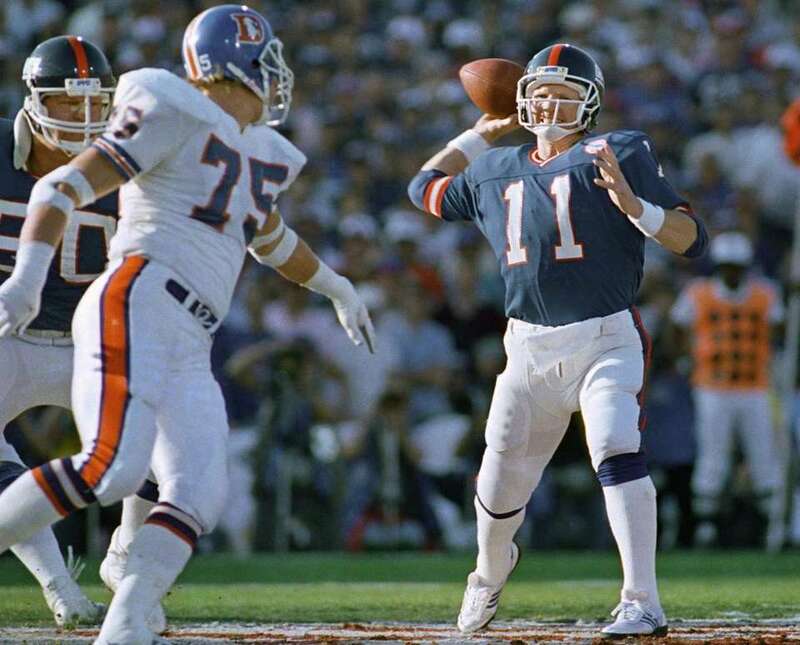 Hoping to purge the past, the Denver Broncos aim to make amends for their three Super Bowl failures under Elway. 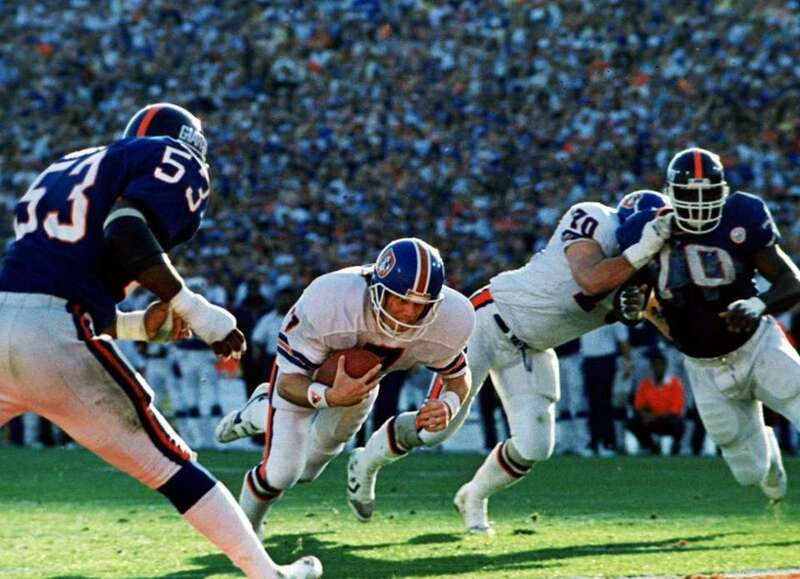 Denver Broncos quarterback John Elway lunges for the goal line to score a 10-yard touchdown in Super Bowl XXI against the New York Giants, Jan. 25, 1987, at the Rose Bowl in Pasadena, Calif.
New York Giants Phil McConkey throws his arms in the air after catching Phil Simms' pass and was stopped just short of the end zone in the third quarter of Super Bowl XXI in Pasadena, Calif., on Jan. 25, 1987. 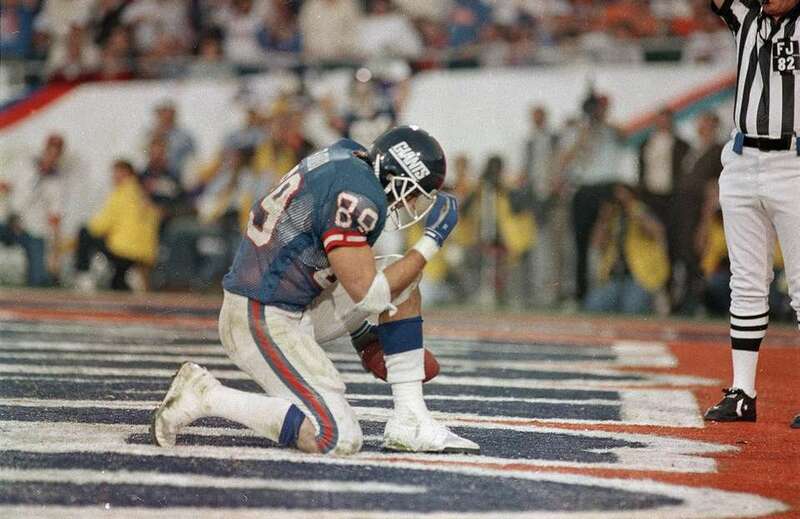 Denver Broncos quarterback John Elway gets sacked for a safety by New York Giants left end George Martin (75) in the second quarter of Super Bowl XXI, Jan. 25, 1987 in Pasadena, Calif.
New York Giants Mark Bavaro kneels down after catching Phil Simms' touchdown pass in the third quarter of Super Bowl XXI in Pasadena, Calif., Jan. 25, 1987. 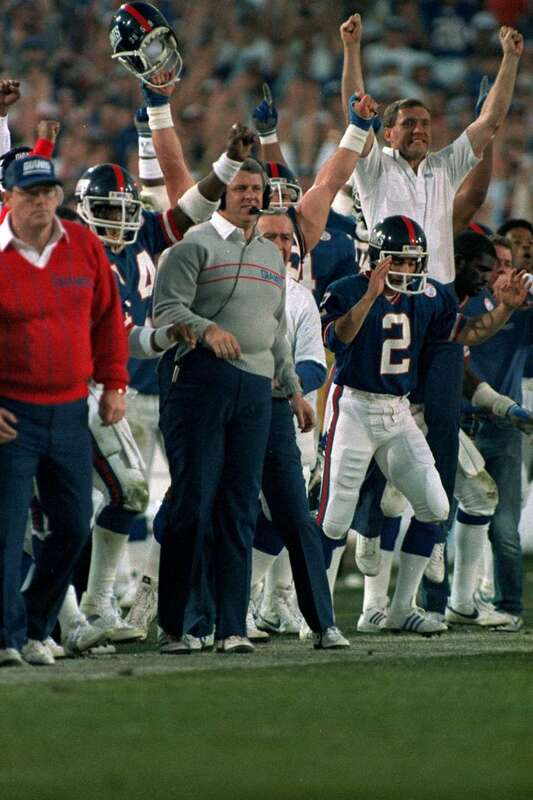 The New York Giants bench, with coach Bill Parcells, second from left, explodes in jubilation, Jan. 25, 1987 after the go-ahead touchdown, making the score 15-10 during the third quarter against the Denver Broncos in Super Bowl XXI, in Pasadena, Calif.